Astronomie - Stephen Hawking’s final paper published, tackles famous paradox Black holes might have “soft hair,” the better to store information. UFO-Forschung: Definitely Not Aliens: These Photos of SpaceXs Night Rocket Launch and Landing Are Amazing! Raumfahrt - An Arizona balloon company is working on a technology to make space satellites obsolete. Heres a rare look inside their giant factory. Europe’s first mission to Mercury will soon be ready for shipping to the spaceport to begin final preparations for launch. The mission passed a major review yesterday, meaning that the three BepiColombo spacecraft, along with ground equipment and mission experts, are confirmed to start the move from ESA’s centre in the Netherlands to Europe’s Spaceport in Kourou, French Guiana at the end of next month. The launch window is open from 5 October until 29 November. “It’s been a long and occasionally bumpy road to this point, and there is still plenty to do until we are ready for launch,” says Ulrich Reininghaus, ESA’s BepiColombo project manager, “but we are extremely pleased to finally move our preparations to the launch site, and are grateful to everyone who has made this possible. Once at Kourou, an intensive six months of essential preparation are needed, including more review checkpoints. Work includes dressing the spacecraft in protective insulation to prepare for the harsh space environment and extreme temperatures they will experience operating close to the Sun, attaching and testing the solar wings and their deployment mechanisms, installing the sunshield, fuelling, and connecting the three spacecraft together. The final weeks will see the spacecraft stack inside the Ariane 5 rocket fairing, and preparing the launch vehicle itself, ready to blast the mission on a seven-year journey around the inner Solar System to investigate Mercury’s mysteries. Timeline of flybys during BepiColombo's 7.2 year journey to Mercury, starting with the opening of the nearly two month long launch window in October 2018. A transfer module will carry two science orbiters to the innermost planet, using a combination of solar power, electric propulsion and nine gravity-assist flybys of Earth, Venus and Mercury to set it on course. The two orbiters will make complementary measurements of the innermost planet and its environment from different orbits, from its deep interior to its interaction with the solar wind, to provide the best understanding of Mercury to date, and how the innermost planet of a solar system forms and evolves close to its parent star. BepiColombo is a joint endeavour between ESA and the Japan Aerospace Exploration Agency, JAXA. 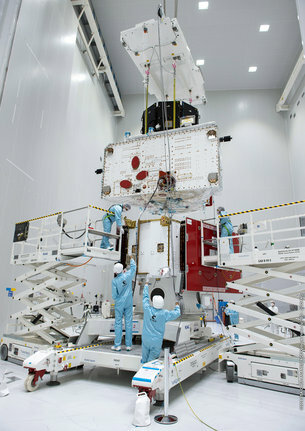 ESA is providing the Mercury Transfer Module, the Mercury Planetary Orbiter and the sunshield and interface structure, and JAXA is providing the Mercury Magnetospheric Orbiter. The BepiColombo mission to Mercury passed a review milestone last week, confirming that it can leave Europe and begin preparations for launch at the Kourou spaceport. The spacecraft and ground equipment, along with personnel, will start transferring to Kourou towards the end of next month. The launch window opens on 5 October until 29 November 2018. 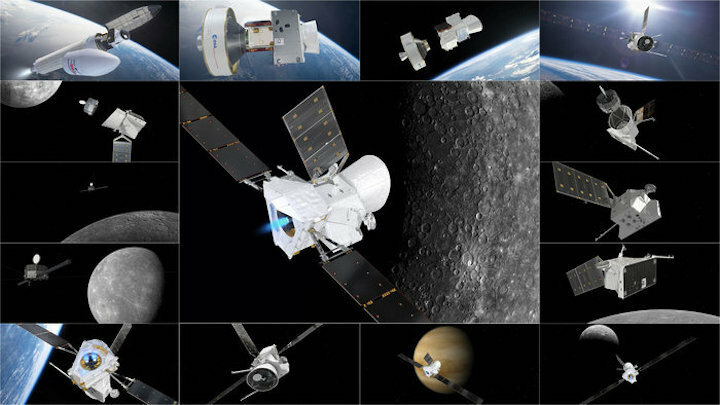 This montage of artist’s impressions represents a selection of new images released today showcasing the spacecraft elements in different situations during the mission’s seven-year cruise to the innermost planet. Some images highlight the moments following launch on the Ariane 5, while others feature flybys at Earth, Venus and Mercury. BepiColombo will fly by Earth once, Venus twice and Mercury six times, using the planets’ gravity to help set course, before entering orbit around Mercury. BepiColombo is Europe’s first mission to the innermost planet and comprises three spacecraft. The ESA-built Mercury Transfer Module will carry the two science orbiters – ESA’s Mercury Planetary Orbiter and Japan’s Mercury Magnetospheric Orbiter – to Mercury. After arriving at Mercury, the trio will separate in stages – some of these moments are also visualised in the new artist’s views. Once at Mercury, the two science orbiters will make complementary observations of the planet and its environment, from its deep interior to interaction with the solar wind, to provide the best understanding of the planet to date and how the innermost planet of a solar system forms and evolves close to its parent star. BepiColombo is a joint endeavour between ESA and the Japan Aerospace Exploration Agency, JAXA. The views of Mercury in this montage are based on imagery from NASA's Mariner 10 and Messenger missions. When the Mercury Transfer Module of the BepiColombo mission fires its electric propulsion thrusters an ion beam is extracted. This is created through the ionization of xenon propellant, generating the charged particles that can be accelerated further using an electric field. Together with gravity assist flybys at Earth, Venus and Mercury, the thrust from the ion beam provides the means to travel to the innermost planet. After escaping the pull of Earth’s gravity with the Ariane 5 launcher, the spacecraft is on an orbit around the Sun. The transfer module then has to use its thrusters to brake against the mighty pull of the Sun’s gravity. It also has to tune the shape of its orbit in order to make a series of nine gravity assist flybys at the planets before finally delivering the mission’s two science spacecraft into Mercury orbit. This image is an excerpt from a supercomputer simulation that models the flow of plasma around the spacecraft just after the high energy ion beam is switched on. An outline of the composite spacecraft with its extended solar arrays is included for reference. The simulation tracks the particles in the beam as well as those that diffuse around the spacecraft, which are created by the interaction of the high energy beam ions with the neutral xenon atoms that also flow out of the thruster. It shows the density of the plasma flowing around the spacecraft and its evolution: red represents high density, blue is low density (see animation for detailed scale). Although the animation is several seconds long it has been slowed down, representing a mere eight milliseconds of real time – the time necessary for the plasma to reach a steady state. The simulation was performed to demonstrate that the plasma produced by the thruster is not damaging to the spacecraft: its materials, including solar arrays or instruments, for example, or to the electric propulsion system itself. The simulations also confirmed there are no spurious or dangerous charging events. Inflight measurements will verify the simulation results and help improve ways in which the generated plasma, spacecraft and space environment interactions can be better modelled. BepiColombo is a joint endeavour between ESA and JAXA. After their seven-year interplanetary journey, the two science orbiters – the Mercury Planetary Orbiter and the Mercury Magnetospheric Orbiter – will start their main mission to provide the most in-depth study of mysterious Mercury to date. The spacecraft begin transferring to Europe’s spaceport in Kourou this week, where an intensive period of preparations will ready the mission for launch later this year. The simulations were performed by Félicien Filleul as part of ESA’s Young Graduate Trainee programme. After years of development, build, and testing, BepiColombo is arriving at Europe’s spaceport in Kourou, French Guiana, in South America for final preflight integration and checkouts. The joint mission between Europe and Japan is now in the home stretch of ground processing ahead of launch. The mission is slated to begin No Earlier Than 5 October 2018 with launch aboard an Ariane 5 rocket that will send Bepicolombo on a seven-year journey to reach the planet Mercury. The first two of four arrivals of the constituent parts of BepiColombo, a dual spacecraft mission, at its launch site marks a major turning point in the processing campaign leading to liftoff later this year. First approved as part of the European Space Agency’s Horizon 2000+ program in November 2009, BepiColombo is a joint venture between the European Space Agency (ESA) and the Japan Aerospace Exploration Agency (JAXA) and represents just the second mission designed to orbit the innermost planet of our solar system. The first two delivery flights arrived in Kourou, French Guiana, this week aboard the Antonov An-124 quad-jet. The first flight delivered the Magnetosphere Orbiter’s Sun Shield and Interface Structure on 24 April. The second An-124 flight arrived safely this morning (Friday, 27 April) at 08:37 local time (11:37 UTC) carrying BepiColombo’s Mercury Planetary Orbiter from ESA. The third and fourth flights will deliver the Mercury Transfer Module from ESA, the Mercury Magnetospheric Orbiter from JAXA, and the final elements of ground handling and processing equipment needed at the launch site. With portions of BepiColombo coming together at the launch site, an intensive six-month process will now begin, including major final review checkpoints, installing the insulation around the spacecraft to protect them from the harsh space environment and extreme temperatures they will experience while operating close to the Sun, attaching and testing the solar wings and their deployment mechanisms, installing the sun shield, fueling the spacecrafts for launch, and integrating the three constituent parts together. 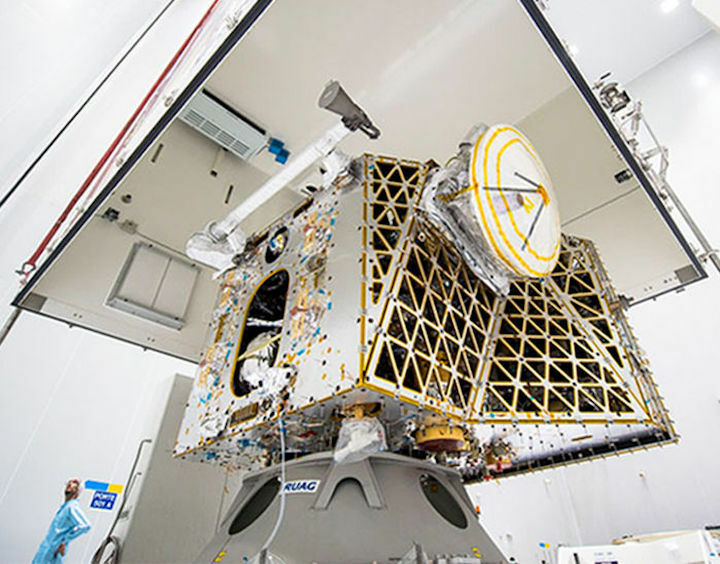 Once these critical tasks are complete, BepiColombo will be enclosed inside the Ariane 5 payload fairing, the final major element in preparing the spacecrafts themselves for launch. The launch window for BepiColombo opens on 5 October and closes on 29 November 2018 – a window designed to ensure the trajectory and multiple planetary flybys and gravity assists needed to eventually insert BepiColombo into orbit of Mercury can be achieved via planetary alignments of Earth, Venus, and Mercury. During the course of its mission, BepiColombo will study the origin and evolution of a planet close to its parent star; study Mercury as a planet, including its forms, interior, structure, geology, composition, and craters; as well as study Mercury’s magnetosphere and its structure and dynamics. The mission will also investigate Mercury’s exosphere’s composition and dynamics, including generation and escape; investigate the origin of Mercury’s magnetic field; and seek to verify Einstein’s Theory of General Relativity by measuring parameters of the parameterized post-Newtonian formalism with high accuracy. Parameterized post-Newtonian formalism is a version of post-Newtonian formalism that explicitly details the parameters in which a general theory of gravity can differ from Newtonian gravity and is used to compare Newtonian and Einsteinian gravity in which the gravitational field is weak and generated by objects moving slowly compared to the speed of light. The study of Mercury’s magnetic field will be accomplished via joint observations of the Mercury Planetary Orbiter and the Mercury Magnetospheric Orbiter during their one Earth year (4.1 Mercurian years), in-orbit primary mission of Mercury. 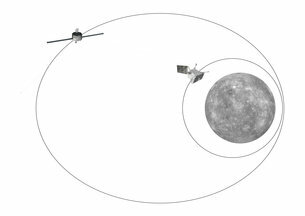 BepiColombo carries enough propellant to potentially be extended for an additional year, resulting in two Earth years of observation around Mercury – or 8.2 Mercurian years. After years of development the BepiColombo spacecraft which will be heading to Mercury from autumn 2018 has at last taken to the air. 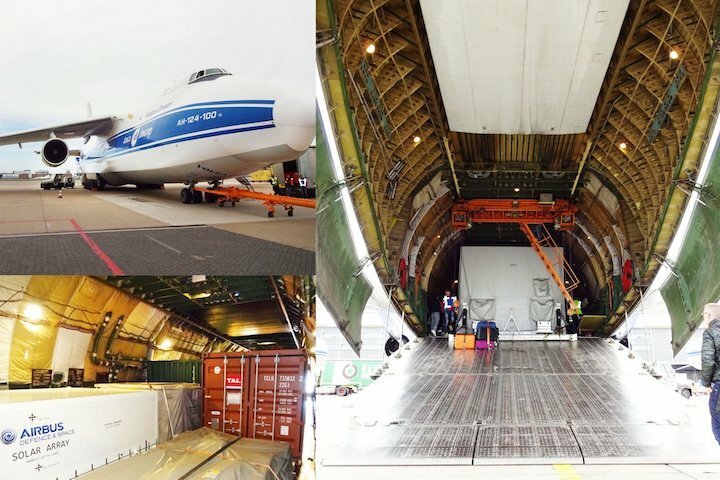 On 23 April 2018 the first elements of the BepiColombo hardware were loaded into an Antonov An-124 cargo plane for transport from Amsterdam´s Schiphol Airport to the European Spaceport Kourou in French Guiana. After a fuelling stop in the Azores Islands the Antonov will arrive early on 24 April. This Antonov flight was the first of four flights needed to transport the spacecraft and all handling and test equipment to Kourou. The flights are supported by three transports by ship for further items. 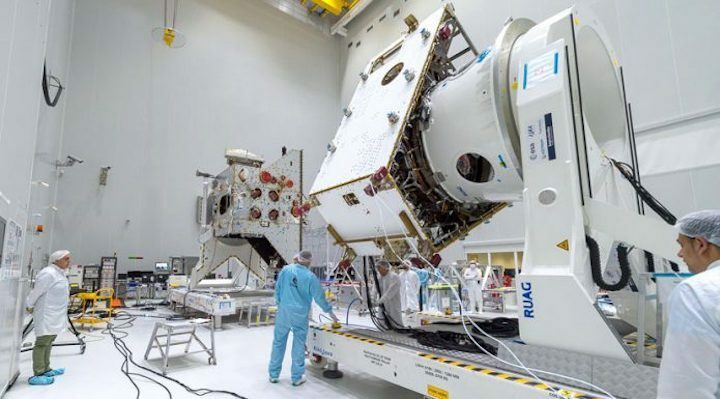 Having completed a comprehensive test programme at European Space Agency´s Technology Centre ESTEC in Noordwijk (The Netherlands) the BepiColombo spacecraft is almost ready for launch. Between May and October 2018 the final launch preparations will be performed so that the spacecraft can then be launched aboard an Ariane 5 ECA. 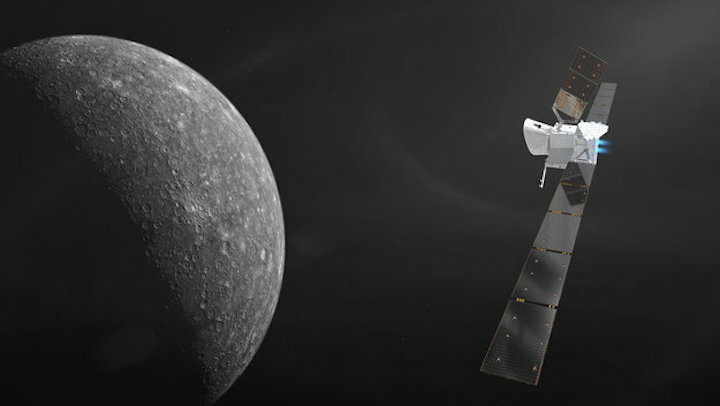 BepiColombo is Europe's first mission to Mercury. It will set off in autumn 2018 (launch window is open from 5 October to 29 November) on a journey to the smallest and least explored terrestrial planet in our Solar System. When it arrives at Mercury in late 2025, it will endure temperatures in excess of 350 °C and gather data during its one year nominal mission, with a possible 1-year extension. BepiColombo is an interdisciplinary mission performed in a partnership between ESA (European Space Agency) and JAXA (Japan Aerospace Exploration Agency). The BepiColombo mission involves the delivery of the MPO (Mercury Planetary Orbiter) and the MMO (Mercury Magnetospheric Orbiter) to complementary orbits around the planet Mercury. 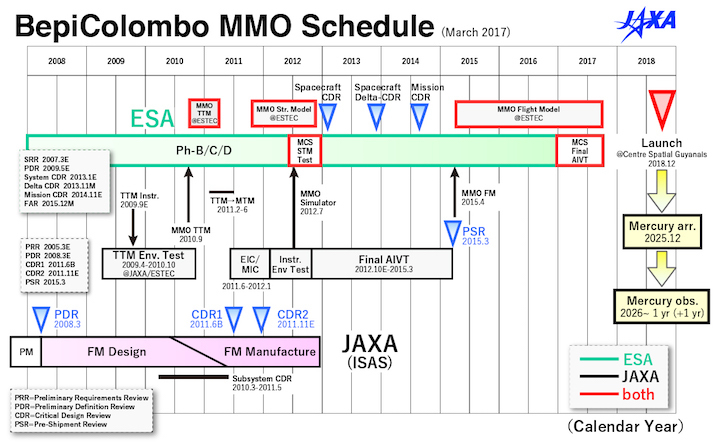 JAXA provides the MMO, whilst Airbus is prime contractor for ESA, providing the MPO and all other spacecraft hardware. The scientific payload is provided by national agencies. The definition of the word mio in the original Japanese is a waterway or fairway. It is a fitting name denoting how far the MMO mission has come, navigating its course past important research and development milestones. It also carries the connotation of wishing the spacecraft a safe journey. Historically, markers called mio-tsukushi were posted to guide boats sailing at rivers and sea. In traditional Japanese poetry, mio-tsukushiinterchangeably means working hard without giving up. This describes the diligent and tenacious sprit of the MMO project team who never ceases to challenge. The spacecraft will travel through the solar wind, a continuous stream of plasma that the Sun emits in the Mercury’s magnetosphere. The Mercury’s magnetospheric interference constantly affects the state of the solar wind in orbit. It conjures up the image of a sea vessel underway with its bow heading forward. Mio is easy to say for many, especially those who do not speak Japanese. 19 suggested Mio. 3 did Mio-Tsukushi. I thank all who responded for your interest in the MMO. We are at the start of the mission with a long way ahead. I hope MIO will bring to us a lot of discoveries about the Mercury. 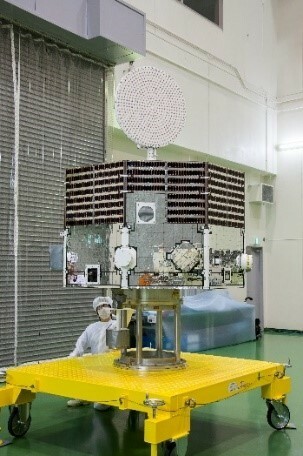 JAXA will send a gift to all who 19 proposers of Mio no sooner than July. BepiColombo, an ESA-JAXA joint mission to explore Mercury, comprises of two orbiters - the MPO, Mercury Planetary Orbiter and the MIO, Mercury Magnetosphere Orbiter. MPO aims at elucidating the surface and internal composition of Mercury. The MIO mission is observing the planet's magnetic field and magnetosphere. JAXA is in charge of the development of the MIO spacecraft and controlling its operation at the target orbit, as Japan is adept at observations of magnetic field and magnetosphere. ESA controls BepiColombo launch and flight to Mercury and orbital insertions. The development and operation of the MPO is also part of the mission performed by ESA. Ariane 5 will launch the tandem satellites. After entering the planet's orbit, detached orbiters are scheduled for approximately year-long observation mission, which both agencies will cooperatively engage in. BepiColombo’s Mercury Planetary Orbiter and Mercury Transfer Module undergo electrical testing during activity at the Spaceport. 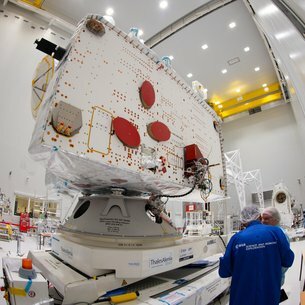 The multi-month payload preparation phase is making progress for the upcoming BepiColombo mission to planet Mercury, which will be launched later this year on an Arianespace Ariane 5 flight from the Spaceport. BepiColombo was developed in a joint effort of the European Space Agency (ESA) and the Japan Aerospace Exploration Agency (JAXA). 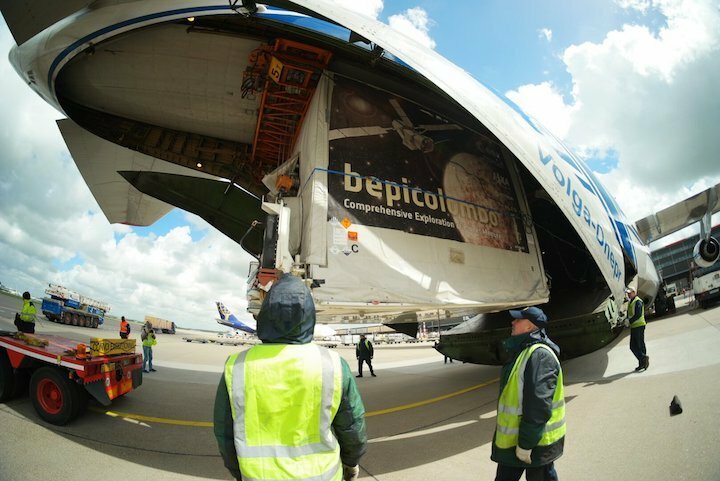 It comprises three spacecraft modules and a sunshield, which were delivered along with ground support equipment and other essential hardware during a series of cargo flights in April and May. Following their arrival in French Guiana and subsequent transfer by road to the Spaceport’s S5 payload preparation facility, the modules – including the Mercury Planetary Orbiter (MPO), Mercury Magnetospheric Orbiter (MMO) and Mercury Transfer Module (MTM) – were removed from their protective shipping containers for inspection. Afterward, they were switched on and battery tested, then fitted with mechanical and electrical ground support systems. Additional activities to be performed include attaching solar wings to the three modules and testing their deployment mechanisms, dressing the spacecraft in protective insulation, installing the sunshield, conducting pressure tests, fueling and integration. The BepiColombo mission is designed to study and understand Mercury’s composition, geophysics, atmosphere, magnetosphere and history. After arriving at Mercury in late 2025, BepiColombo will have a nominal one-year duration with the possibility for an extension. Ariane 5’s launch of BepiColombo – which gets its name from Italian Professor Giuseppe (Bepi) Colombo – is designated VA245 in Arianespace’s launcher family numbering system. Europe’s first mission to Mercury will target the early morning of 19 October for launch, Arianespace and ESA announced today. The joint ESA-JAXA BepiColombo mission will launch on an Ariane 5 from Europe’s Spaceport in Kourou, setting a trio of spacecraft on course for Mercury. The spacecraft will travel together: a transfer module will carry the two science orbiters – the ESA Mercury Planetary Orbiter and the JAXA Mercury Magnetospheric Orbiter – using a combination of solar power and electric propulsion, and nine gravity-assist flybys of Earth, Venus and Mercury. Lift-off is anticipated for around 01:45 GMT (03:45 CEST), equivalent to 18 October 22:45 in local time (GFT). The date chosen represents the first option to launch, taking into account some additional, unplanned testing performed in Kourou. The launch window remains open until 29 November. “We have had a great start to our launch campaign in Kourou, and are on track for launch in less than ninety days,” says ESA’s BepiColombo project manager Ulrich Reininghaus. Since arriving at the Spaceport in May, many essential preparations have been completed. For example, the spacecraft have been fitted with their protective high-temperature blankets, xenon and nitrogen tanks have been checked, loaded and pressurised, and the deployment tests and final installations of the solar arrays are underway. Simulations for key operations have also started at ESA’s operations centre in Darmstadt, Germany. Personnel are also practicing non-routine events to be prepared for all eventualities on the journey to Mercury. The composite spacecraft ‘stack’ will make the first flyby of Mercury just three years after launch. A number of scientific instruments will be active during the planetary flybys, with the transfer module’s ‘webcams’ offering the potential to capture simple images before the main science camera is operational in Mercury orbit. Once separated into their final orbits, the two scientific craft will make complementary measurements of the innermost planet and its environment, from its deep interior to its interaction with the solar wind, to provide the best understanding of Mercury to date. The results will provide insight into how the innermost planet of a solar system forms and evolves close to its parent star. 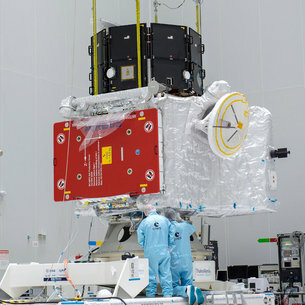 The two science orbiters of the joint ESA-JAXA BepiColombo mission are connected in their launch configuration and the European science orbiter and transport module have been given the go-ahead to be loaded with propellants. The mission completed its Qualification Acceptance Review in the last week, which confirms it is on track for its 19 October launch. The three-spacecraft mission is currently scheduled to launch on an Ariane 5 at 03:45 CEST (01:45 GMT) on 19 October, or 22:45 local time in Kourou on 18 October, with the launch window remaining open until 29 November. Following the successful fuelling readiness review on 30 August, the chemical propellants – such as hydrazine – can be added to the European Mercury Transfer Module (MTM) and Mercury Planetary Orbiter (MPO). “These important reviews represent further key milestone in our launch campaign, bringing us to the final stages of our launch preparations, while in the longer term enabling the journey and operations at Mercury,” says Ulrich Reininghaus, ESA’s BepiColombo project manager. The transfer module will use both ion propulsion and chemical propulsion, in combination with gravity assist flybys at Earth, Venus and Mercury to bring the two science orbiters close enough to Mercury to be gravitationally captured into its orbit. There, MPO will use its small thrusters to deliver JAXA’s Mercury Magnetospheric Orbiter (MMO) into its elliptical orbit around Mercury, before separating and descending to its own orbit closer to the planet. This month the two science modules were arranged in their launch configuration for the first time in over a year; the last occasion was at ESA’s technical centre in the Netherlands during final testing before shipment to Europe’s Spaceport in Kourou, French Guiana. The MTM will be integrated at the bottom of the stack once the propellant-loading activities have been completed. A test-run of the integration was already exercised last week with the unfueled modules. The sunshield that will protect the MMO from the Sun’s radiation on the seven year journey will also be added much closer to launch. MMO’s main science goals are to provide a detailed study of the magnetic environment of Mercury, the interaction of the solar wind with the planet, and the diverse chemical species present in the exosphere – the planet’s extremely tenuous ‘atmosphere’. The MPO will focus more on surface processes and composition, and together with MMO, will help piece together the full picture of the interaction of the solar wind on the planet’s environment and surface. Together they will watch how this interaction at the surface feeds back into what is observed in the exosphere and how that varies both in time and location – something that can only be achieved with two spacecraft in such complementary orbits. Tiny and relatively ignored, Mercury holds outsize mysteries. Only two spacecraft have made the difficult journey to its sunbaked environs. Now comes the planet's third and most ambitious visitor, the European-Japanese mission BepiColombo, a pair of probes due to launch on 20 October. 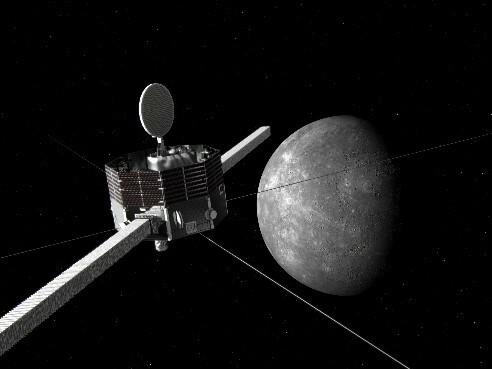 Picking up where the last visitor, NASA's MESSENGER mission, left off in 2015, BepiColombo will probe puzzles including Mercury's skewed magnetic field, its overstuffed iron core, and strange lakelike depressions perhaps carved by escaping volatile elements. "MESSENGER really threw into question many theories about how this planet came to be," says BepiColombo team member Emma Bunce of the University of Leicester in the United Kingdom. BepiColombo "is perfectly timed and set up to answer these questions," says mission scientist Johannes Benkhoff of the European Space Agency's (ESA's) technology center in Noordwijk, the Netherlands. The first Mercury probe, NASA's Mariner 10, made a series of flybys in 1974 and 1975, some 40 years before MESSENGER. But getting a spacecraft into orbit around Mercury without it plummeting into the sun was a tough problem. In the 1980s, mission planners worked out the complex series of gravity assists from other planets needed for the journey, building on work by Italian astrophysicist Giuseppe "Bepi" Colombo, now honored by the new mission. A second challenge—how to endure solar radiation 10 times as strong as at Earth while observing a surface heated to 400°C—also delayed a second mission. "Spacecraft had never spent so long close to the sun," says Sean Solomon, director of the Lamont-Doherty Earth Observatory in Palisades, New York, who led the MESSENGER mission. The ESA and NASA missions were both approved in the late 1990s, but the smaller $450 million MESSENGER mission got to the launchpad first and reached Mercury in 2011. The more ambitious €1.65 billion BepiColombo hit a few bumps during development, including solar arrays that degraded too quickly, which delayed its launch about 5 years. Japan joined the mission in 2003, eager to build on its success observing a planetary magnetic field in the 1992 Geotail mission, which studied the tail of Earth's magnetosphere. "Mars and Venus don't have magnetic fields, so the target was Mercury," says Go Murakami, project scientist for Japan's part of BepiColombo at the Japan Aerospace Exploration Agency's Institute of Space and Astronautical Science (ISAS) in Sagamihara. ISAS's contribution is a separate spacecraft with five instruments that focus on the magnetosphere, whereas the larger ESA orbiter, with 11 instruments, is equipped to study the planet itself. Following launch from ESA's spaceport in French Guiana, the two stacked craft will embark on a 7-year journey, swinging once past Earth, twice past Venus, and six times past Mercury before finally separating and entering orbit around the planet in 2025. One mystery awaiting the mission is MESSENGER's discovery of many volatile elements on the planet's surface, including chlorine, sulfur, potassium, and sodium, which should have been boiled off by the sun's heat long ago. 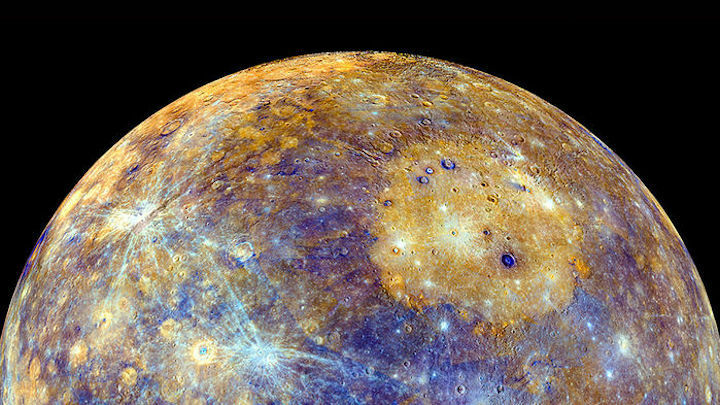 "There is something odd in the formation history of Mercury," Benkhoff says. A clue comes from the ratio of potassium to thorium, which indicates a planet's temperature during formation. Benkhoff says Mercury's ratio points to a cooler origin, farther out than Mars. Volatiles are more abundant at those distances, and if Mercury formed beyond Mars and drifted in only later, it would have retained a larger supply of volatiles. BepiColombo will make a sharper map of the volatiles than MESSENGER, thanks to an imaging spectrometer that identifies elements by how they fluoresce when hit by solar x-rays. That could help it track the loss of volatiles today. Depressions spotted by MESSENGER, tens of meters deep and hundreds wide, could be formed by escaping gases. If any have changed since MESSENGER's visit, it will suggest a large volatile supply that continues to vent into space. The European Space Agency's orbiter will be joined by a smaller Japanese spacecraft. BepiColombo will also scrutinize the peculiar contrasts between the planet's north and south. The north has large areas covered by smooth volcanic material that must have erupted relatively recently, whereas the south is cratered and ancient. Mercury's magnetic field mirrors the divide, as it, too, is shifted to the north. "How are these asymmetries connected?" Solomon asks. Inside Mercury is another anomaly for the mission to explore: the planet's huge iron core, extending out to 80% of its radius, surrounded by a relatively thin layer of rock. One theory is that early in life, Mercury suffered a collision with another body that blasted off most of the lighter rocky material, leaving the heavier iron behind. Researchers would expect the iron core to have cooled and solidified by now, yet at least some of it is still liquid and churning, generating a magnetic field. Although the field is 100 times weaker than Earth's, it accelerates electrons from the solar wind to high energy levels, a phenomenon not seen in Earth's magnetosphere. Magnetometers aboard both the European and Japanese spacecraft should help the team understand the processes behind the energy boost, says James Slavin, a lead MESSENGER investigator at the University of Michigan in Ann Arbor, who expects "definitive answers to the mystery." Studies of the magnetosphere could have implications beyond the solar system. Exoplanets found orbiting cool red dwarf stars could host liquid water—and conceivably life. But because they orbit their stars more closely than Mercury orbits the sun, they likely face strong stellar winds and radiation levels inimical to life—unless the planet is protected by a magnetosphere like Mercury's. "If we want to understand if life can [survive] on such planets, one of the important bits of information is the magnetosphere," Murakami says. The MMO spacecraft mainly aims the study of the magnetic field and magnetosphere of Mercury. JAXA/ISAS is responsible for its development and employment on the Mercury orbit. Earth and Mercury have intrinsic magnetic field, but Mars and Venus do not. Why? Comparison of the Mercury's magnetic field with Earth's brings us the large step for the understanding of the terrestrial magnetic field and magnetosphere, and the magnetospheres in the various scales in the Universe. The magnetic field around Mercury in high accuracy will be surveyed for the study of the origin of planetary magnetic field. The magnetosphere will be surveyed in detail for the investigation of the universality and the singularity of planetary magnetospheres. The large-scale structure and variation of the thin 'atmosphere' tell us their generation / disappearance processes. The powerful environment near the sun is observed, and the energy process is solved. MMO is the 'Spin-type' spacecraft with the spin rate of 4 seconds. This is because of the "3-dimensional velocity distribution of particles" and "extension of four long wire antennas (15m) and two MASTs (5m) for electromagnetic field measurements with centrifugal force". The spin axis is almost perpendicular to the Mercury equatorial plane. This is 1) the rejection of solar reflection light into the upper / lower surface of the spacecraft and 2) the continuing aiming of the High-Gain antenna to the Earth with small efforts. On the side panel, "SSM", a kind of mirror, is fully stuck in order to reflect the much intence sun light. The MMO spacecraft will enter to the polar orbit with "400km periheam and 12,000km apoherm", in order to make magnetic field mapping of all spheres and observation of the Mercury magnetosphere in whole regions. Orbital period is 9.2 hours. This orbit has the same plane and and 4 times cycle (MPO:2.3 hour) of the MPO orbit, and can perform cooperation observation with MPO easily. 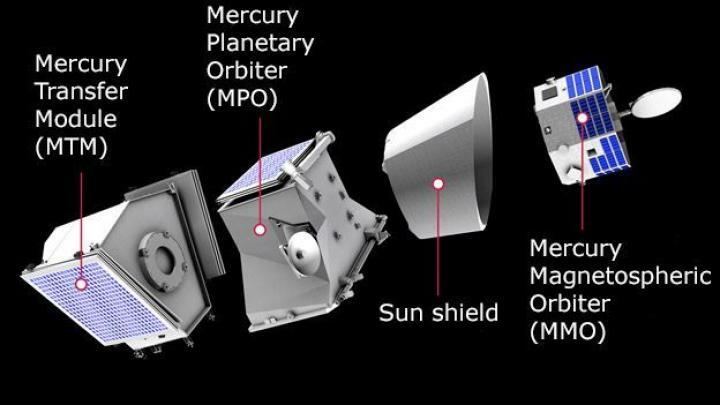 In the cruise phase to Mercury, MMO is carried with Mecury Composite System (MCS) under the control of ESA, jointed with the MPO spacecraft and promotion modules. After the arrival, the MMO will be separated by spin-ejection, and be operated by Sagamihara Space Operation Centre in ISAS/JAXA with UDSC 64m antenna in Nagano Japan. Payloads for MMO and MPO spacecraft was selected by the international payload review comittee in fall 2004. Now, several joint payload teams with Japanese and European scientists actively make design and development efforts. Moreover, the observation plan after the Mercury arrival will draw up and carry out by the "BepiColombo Science Working Team" which involved in not only the payload development members but also the theoretical researchers in both Europe and Japan.